On The English Language List I’ve mentioned Twitter a couple of times in an attempt to foment some more interest among the English teaching community. I mentioned using Twitterfall and a couple of people asked me about it. It’s a subscription list without a public archive, so since I can’t link you there I’m just going to copy and paste some relevant bits. I signed up for Twitter back in 2007, and like most people who are new to it, I really couldn’t see the point. It wasn’t until about a month ago that I started using it in earnest, and I’m now kicking myself for all that wasted time.You probably couldn’t fail to have noticed the splash that Twitter is making now in the media, much of it withering in its contempt, but mainly from people who just don’t get it. It really is something that you can only understand by participating, and that means throwing yourself in wholeheartedly. I have also successfully used some twitter tools in the classroom. I had a great English Lang lesson last week using www.twitterfall.com on the interactive whiteboard to provide a ‘race against time’ element as the group found linguistic comments on tweets before they fell off the bottom of the screen. Language and technology was an obvious focus, but we also had gender and power comments coming through, and all the linguistic methods covered. I’ve had a look at www.twitterfall.com, got myself a twitter account and am currently revisiting Language and Technology. The posts about this site and how to use it in lessons sound interesting: has anyone got any specific lesson plans or activities I could use, just to get started? My advice would be, just get started. Get Twitterfall up on screen, then get kids discussing what’s there and why it’s as it is. You can alter parameters such as the rate at which tweets display from the panel on the right, and if you want to pause the flow to spend time on a particular tweet you just need to move the cursor over the tweets and the stream is automatically paused. Oh – there was loads of stuff. It went down a storm. What’s really cool is when you have a big enough network to request some live tweets aimed directly at the class. I got three when I did this last week: 2 from the States and one from an ex-pupil who’s now a journalist. She’s just tweeted that she’s working on the story of the Doncaster man who followed his sat-nav over a cliff-edge. He won’t tell her where he lives. Perhaps he doesn’t know. Now I’ll be willing to venture that those words have not been uttered too frequently with regard to General Studies which sadly does not enjoy the most positive of reputations among our students. So what pedagogical fireworks on my part gave rise to such enthusiasm? Sadly, I can’t claim much credit at all. It was down to the simple genius of etherpad. A large proportion of the class knew that they were on their last lesson before dropping the subject, so I was on a hiding to nothing trying to engage the whole class. 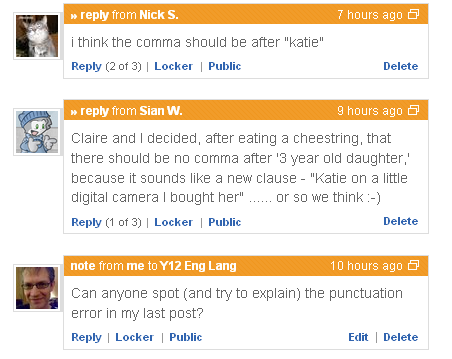 So I allowed them the choice of getting on quietly with work for other subjects, or joining me on etherpad to work on a past paper essay question. There was quite a buzz in the room as students cottoned on to what was happening. You can get a flavour of what happened by looking at our etherpad here. You can access the chat transcript too, which is where most of the work went on. It took a little while for them to get into what was happening, but I was pleased that it didn’t degenerate into MSN style chit-chat: they stayed pretty focussed on the task most of the time. The students were particularly impressed by the fact that we were joined towards the end of the session by Melissa, a teacher from Virginia, USA, after I’d tweeted a quick invitation for anyone free to join us. But never again a flatpack wardrobe from MFI. Actually that’s not going to happen anyhow, as they’ve gone bust. No wonder. I had to return to the shop to get a packet of fixings that had been left out of one of the eight (count ’em: eight!) boxes that the thing came in. Then I had to redo almost every stage at least once as the instructions were so hopeless (and my practical skills so unpractised) that I couldn’t tell which size of screw was supposed to go where, and which way round the top and bottom panels would be, and on, and on, and on. So all the school related work I wanted to get cracking with today has been shunted back to tomorrow. Some of that had already been shifted from last week. And that’s before even considering all the usual household stuff that didn’t get done today. Last week I took my Y11 English class into our school’s new(ish) virtual media room. It’s kitted out with a stereoscopic projection system, and I wanted to use a piece of software on Of Mice and Men that I’d seen briefly demonstrated at an after school CPD session recently. The package by Reachout Interactives, called Mindscene is based on a mindmap, but allows you to travel along the various branches of the map, interacting with elements in it as you go. Key quotations can be heard spoken by actorss with authentic accents (handy for us in the UK), there are question-mark icons periodically that offer discussion prompts, and bulletin boards are placed at various strategic points where you can add your own comments or post images. If students had access to the software on the school network I could envisage this fgeature being used effectively as an assignment planning tool, as I believe you can pull out the content of the bulletin boards as a document file. I’d had cance to spend a few minutes familiarising myself with the software and how to control it. The package can be used on a regular pc monitor and it would be better to have installed it on my own laptop to get to know the content beforehand. Controlling the movement through the virtual landscape using the gyro-mouse (a wireless contoller with an internal accelerometer that converts movement of the hand to control movement on screen) was beyond me, at first. As it turned out that was no bad thing. The opportunity for my students to laugh at me is one they always seize with relish. It led to a relaxed, humorous atmosphere from the off (the gawky 3D glasses are quite an ice-breaker, too), and fortunately our tech-guy Tomek was on hand to step in and do the controlling for me. This allowed me to focus on the content, using our explorations to prompt questions, comments and discussion. The students, a lower set group with a couple of fairly disaffected members, were engaged throughout the 45 minutes or so that we spent using the software. I was really impressed with the recall that that they showed even though this was a first revision of a text we studied last year. I’m pretty sure I wouldn’t have got the same response in a regular classroom revision session. The 3-D effects are pretty much a novelty rather than a genuinely functional feature (software that I’ve seen demoed for Geography and Biology that allows virtual tours of landscape feaures, or body organs was more obviously useful in a practical sense). Nevertheless, the effect of being visually and aurally immersed in the content we were considering certainly had a positive effect on the engagement of my students, and I think the subsequent writing task they have had to do has benefitted from the experience. More reflections on the above, and related matters, to follow when I’ve had a little more time to use the features Edmodo has to offer, and to reflect on this thought-provoking blog post. This is a late-night, very tired post. But it’s a nice, energised tired, not the weary crushing type. It may have taken me many years, where others cotton on in days or weeks, but I think I’ve finally reached the point where I can be optimistic and feel that I can begin properly to integrate my personal interest in technology and learning into my everyday practice. This is happening (if it is happening – I hope it’s not just another false dawn) largely thanks to the power of Twitter to open up an expanding network of fellow teachers, learners and other people from a range of backgrounds and disciplines. But for the inspiration, ideas and most importantly the confidence and enthusiasm I’ve gained over just the past couple of weeks since using Twitter regularly, I wouldn’t have got round to doing my first video podcast. I wouldn’t have entered the web conference blogged about in my last post, or joined last night in the EdTech Roundup Flashmeeting (though neither my webcam nor microphone were playing the game so mine was a rather marginal participation!) 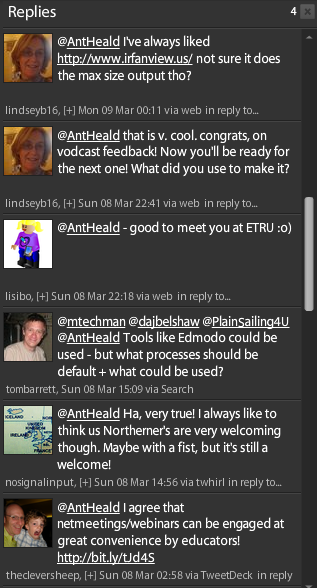 And I wouldn’t have got round to setting up an edmodo account and started to use that with some of my students today.